Fibrolamellar hepatocellular carcinoma, or fibrolamellar carcinoma, is an uncommon malignant neoplasm of the liver. Fibrolamellar carcinoma has distinctive clinical, histologic, [2, 3] and radiographic features that distinguish it from the relatively more common hepatocellular carcinoma (HCC). Fibrolamellar carcinoma occurs in a younger population than does HCC, and it is typically not associated with underlying liver disease or elevated serum levels of alpha-fetoprotein tumor markers. Also, fibrolamellar carcinoma may have a slightly better prognosis than HCC. [5, 6] See the images of fibrolamellar hepatocellular carcinoma below. Contrast-enhanced computed tomography (CT) scan of fibrolamellar carcinoma demonstrates a large, heterogeneously enhancing mass in the right lobe of the liver, with a hypoattenuating central scar and punctate, central calcification. Digital subtraction arteriogram (obtained by injection of the celiac axis) demonstrates fibrolamellar carcinoma; the carcinoma appears as an area of hypervascularity and tumor blush in the inferior aspect of the liver. Perhaps because of the younger ages of the patients and the lack of coexisting cirrhosis, patients with fibrolamellar carcinoma are often treated aggressively. Resection of large tumor masses, of metastatic disease, and even of recurrent disease can extend patient survival. Ultrasonography has been used in the surveillance of the progression of known intrahepatic lesions. Radionuclide sulfur-colloid scans or scans obtained with labeled red blood cells are occasionally useful in the differentiation of fibrolamellar carcinomas from other types of hepatic tumors. Percutaneous biopsy with CT scanning or ultrasonographic guidance may be necessary for a definitive preoperative diagnosis of fibrolamellar carcinoma. For the best evaluation of the liver and liver tumors with CT scanning, the intravenous administration of iodinated contrast material is necessary. Therefore, the use of CT scanning is limited in patients who cannot have iodinated contrast material because of an allergy or renal insufficiency. In these patients, MRI is preferred. In addition, CT scanning uses ionizing radiation; therefore, it can be relatively contraindicated in children or in women of childbearing age, in whom radiation doses should be limited as much as possible. The imaging time with MRI examinations tends to be longer than with CT scanning or ultrasonography. In patients who are unwilling or unable to remain still during the imaging period, poor-quality images can result because of motion artifact; these artifacts can limit the usefulness of the MRI examination. Some patients may become claustrophobic while they are in the MRI machine; patients may require sedation, or they may not be able to complete the examination. Because of the high magnetic field strength, MRI is contraindicated in patients with a cardiac pacemaker or some internal metallic object, such as an aneurysm clip or metal shrapnel or filings in a critical location. Ultrasonography is more operator dependent than is CT scanning or MRI, and poor technique in scanning can limit its diagnostic usefulness. Ultrasonography may be limited by the patient's anatomy. Hepatic imaging may be difficult in obese patients or in patients whose liver is located high under the ribs. Overlying bowel gas may obscure portions of the liver in some patients. Plain radiographs of the abdomen may demonstrate nonspecific secondary findings related to hepatomegaly or to the abdominal mass in patients with fibrolamellar carcinoma. Findings may include an enlarged liver shadow and/or displacement of adjacent, gas-filled bowel loops. Calcifications in the tumor also may be visible on plain abdominal images. Plain radiographic findings in patients with fibrolamellar carcinoma are nonsensitive and nonspecific. These findings are not helpful in the detection or characterization of the tumors. Any cause of space-occupying abdominal masses or hepatomegaly can produce plain radiographic findings similar to those of fibrolamellar carcinoma, thereby causing a false-positive finding. Changes associated with fibrolamellar carcinoma may not produce any abnormality on plain radiographs, thereby causing a false-negative result. On nonenhanced scans, the primary fibrolamellar tumor typically appears as a large, solitary, hypoattenuating mass with well-circumscribed and lobulated margins. During the arterial-enhancing phase, the tumor is heterogeneously enhancing and becomes generally hyperattenuating with respect to the relatively less strongly enhancing surrounding liver. During the portal and delayed phases, the tumor remains enhancing and becomes more homogeneous in appearance, with its density more closely matching that of the liver as equilibrium is achieved. Central scars (as seen in the image below) are present in 50-70% of fibrolamellar carcinomas and appear on CT scans as a central stellate hypoattenuating and hypoenhancing region in the mass. The scars may not be enhancing at all, or they may show mild enhancement on delayed-enhanced scans. Calcifications occur in 35-60% of fibrolamellar tumors, and they can be best identified as hyperattenuating foci on nonenhanced CT scans. Metastatic lymphadenopathy is present at the time of initial diagnosis of fibrolamellar carcinoma in 50-70% of patients, and the lymph nodes are frequent sites for recurrent disease after surgical resection of primary lesions. 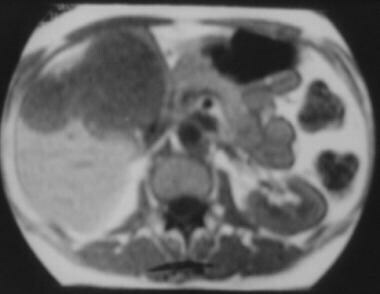 Lymph node metastases are found most often in the porta hepatis (as demonstrated in the image below), and they can have a CT scan appearance similar to that of intrahepatic lesions. 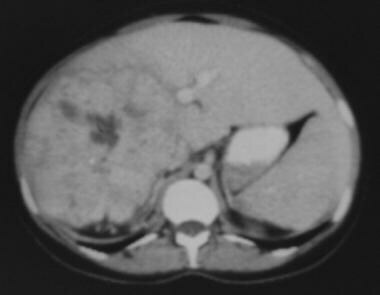 Computed tomography (CT) scan in a patient with fibrolamellar carcinoma shows metastatic lymphadenopathy in the porta hepatis–gastrohepatic region. Other distant metastases, such as those to the lungs, peritoneum, or more distant lymph nodes, also can be detected by using CT scanning. Abdominal CT scanning is sensitive in detecting the primary intrahepatic tumors of fibrolamellar carcinoma and of regional lymph node metastases. When found in the appropriate clinical setting of a young patient without cirrhosis, the characteristic CT scan appearance of a large, lobulated, heterogeneously enhancing tumor with a central scar and calcification, often with local lymph node metastases, can provide a confident diagnosis of fibrolamellar carcinoma. Because most patients are treated with surgical resection, percutaneous biopsy may be useful in the preoperative confirmation of the diagnosis. T1-weighted magnetic resonance image of the liver in a patient with fibrolamellar carcinoma shows a lobulated and well-defined mass with a relatively homogeneous, hypointense appearance. T2-weighted magnetic resonance image (same patient as in the previous image) shows a fibrolamellar carcinoma with increased signal intensity relative to that of the surrounding liver. The central scar usually appears hypointense on all images obtained with all sequences. The appearance of the scar on magnetic resonance images can be useful in differentiating fibrolamellar carcinomas from FNH, because scars in FNH tend to be hyperintense on T2-weighted images. Fibrolamellar carcinomas typically do not contain intracellular fat; therefore, the presence of fat on fat-saturated, in-phase, and out-of-phase MRI scans suggests HCC or an adenoma. On gadolinium-enhanced magnetic resonance images, the enhancement patterns seen in fibrolamellar carcinomas are similar to those seen on contrast-enhanced CT scans. Early heterogeneous enhancement occurs during the arterial phase and progresses to more homogeneous enhancement during delayed phases. The central scar does not enhance during the arterial phase, but it may demonstrate mild enhancement in the later portal or equilibrium phases. Gadolinium-based contrast agents have been linked to the development of nephrogenic systemic fibrosis (NSF) or nephrogenic fibrosing dermopathy (NFD). NSF/NFD is a debilitating and sometimes fatal disease. Characteristics include red or dark patches on the skin; burning, itching, swelling, hardening, and tightening of the skin; yellow spots on the whites of the eyes; joint stiffness with trouble moving or straightening the arms, hands, legs, or feet; pain deep in the hip bones or ribs; and muscle weakness. MRI is sensitive in the detection of intrahepatic masses of fibrolamellar carcinoma, and the modality may be slightly more sensitive than CT scanning in depicting multiple recurrent intrahepatic lesions. Although metastatic lymphadenopathy can be seen on MRI scans, CT scanning is probably more useful for detecting distant metastases, particularly in the lungs. CT scanning is also relatively less expensive than MRI; therefore, CT scanning is most appropriate for initial imaging and follow-up in most patients. MRI is most useful in the characterization of indeterminate masses seen on CT scans. Often, MRI features of tumors can help to confirm a suggested diagnosis of fibrolamellar carcinoma, or they can exclude the possibility of other entities such, as FNH or HCC. As with CT scanning, MRI is not entirely specific for fibrolamellar carcinoma, and other liver lesions (eg, adenoma, HCC, FNH) can occasionally mimic the appearance of fibrolamellar carcinoma. For instance, the hyperintense scar that is usually associated with FNH has been reported in at least 1 patient with fibrolamellar carcinoma. Abdominal ultrasonograms are often obtained for the initial evaluation of patients with abdominal pain; therefore, ultrasonography may be the first imaging study available in patients with fibrolamellar carcinoma. 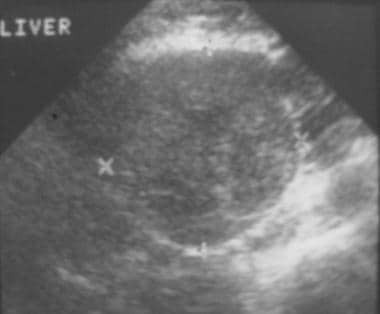 On ultrasonograms, the primary tumor can be seen as a solitary, well-defined hepatic mass with a heterogeneous echotexture (as demonstrated in the image below). The tumor's scar may be seen as a central, hyperechoic structure, and calcification may be represented by an echogenic focus with shadowing. Ultrasonogram shows a heterogeneous echotexture mass in the liver that corresponds to a fibrolamellar carcinoma. Because the primary intrahepatic tumors of fibrolamellar carcinoma are often large, the likelihood of detecting the mass with ultrasonography is high. However, ultrasonography is less sensitive than CT scanning in depicting tumoral characteristics, such as scars and calcifications, which aid in the differentiation of fibrolamellar carcinoma from other intrahepatic tumors. Ultrasonography is less accurate than CT scanning in staging extrahepatic disease. After the initial detection of the intrahepatic mass with ultrasonography, further evaluation with CT scanning or MRI is usually necessary for the definitive diagnosis and staging of fibrolamellar carcinoma. 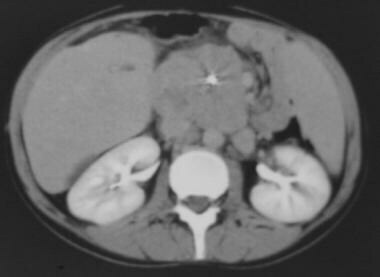 Although, in a young patient, a large intrahepatic mass with a central scar is suggestive of fibrolamellar carcinoma, other entities (eg, FNH, hepatocellular adenoma, possibly giant cavernous hemangioma) may have a similar appearance on ultrasonograms and result in false-positive findings. False-negative ultrasonographic findings may occur in patients with obesity, underlying cirrhosis or fatty infiltration (which is not typical in patients with fibrolamellar carcinoma), or a body habitus that may obscure good visualization of the liver during ultrasonography. Radionuclide imaging studies are not useful in the detection of fibrolamellar carcinoma. However, in some patients, these studies may be useful in the differential diagnosis of the tumors. On sulfur-colloid liver-spleen scans, fibrolamellar carcinomas appear as photopenic defects in the liver; the masses demonstrate decreased activity. On scans obtained with red blood cells labeled with technetium-99m (99m Tc), fibrolamellar carcinomas typically demonstrate increased activity on early arterial-phase images. This finding is followed by decreased activity with respect to the surrounding liver on delayed-phase images. In difficult or equivocal cases, radionuclide sulfur-colloid images or images obtained with labeled red blood cells may provide information that increases the level of confidence in the diagnosis of fibrolamellar carcinoma. However, these studies are not useful in detecting or staging fibrolamellar carcinoma. Sulfur-colloid liver-spleen scans can demonstrate photopenic lesions in the liver with many entities, including benign and malignant liver tumors, cysts, and abscesses; therefore, false-positive results are possible. False-negative sulfur-colloid scans may occur when diffuse hepatocellular dysfunction, such as cirrhosis, results in poor tracer uptake in a noncancerous liver. Other liver tumors may have uptake patterns on labeled red blood cell scans that are similar to the uptake pattern of fibrolamellar carcinoma; therefore, false-positive findings can result. The tumors may demonstrate normal activity levels, resulting in a false-negative finding. Angiography is usually not beneficial in the detection, staging, or evaluation of fibrolamellar carcinoma. 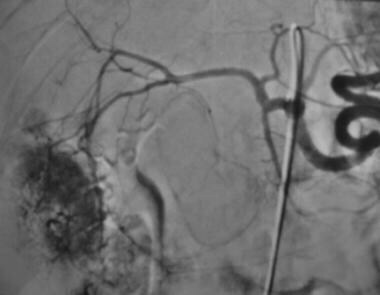 If obtained, angiograms demonstrate the primary tumor as a hypervascular mass (as seen in the image below) with multiple feeding arteries, a dense tumor blush, and an avascular central scar. Liu S, Chan KW, Wang B, Qiao L. Fibrolamellar hepatocellular carcinoma. Am J Gastroenterol. 2009 Oct. 104(10):2617-24; quiz 2625. [Medline]. Wood WJ, Rawlings M, Evans H, et al. Hepatocellular carcinoma: importance of histologic classification as a prognostic factor. Am J Surg. 1988 May. 155(5):663-6. [Medline]. Malouf G, Falissard B, Azoulay D, et al. Is histological diagnosis of primary liver carcinomas with fibrous stroma reproducible among experts?. J Clin Pathol. 2009 Jun. 62(6):519-24. [Medline]. Titelbaum DS, Burke DR, Meranze SG, et al. Fibrolamellar hepatocellular carcinoma: pitfalls in nonoperative diagnosis. Radiology. 1988 Apr. 167(1):25-30. [Medline]. [Full Text]. Ganeshan D, Szklaruk J, Kundra V, Kaseb A, Rashid A, Elsayes KM. Imaging features of fibrolamellar hepatocellular carcinoma. AJR Am J Roentgenol. 2014 Mar. 202 (3):544-52. [Medline]. Chun YS, Zimmitti G. Fibrolamellar variant of hepatocellular carcinoma. Recent Results Cancer Res. 2013. 190:101-10. [Medline]. 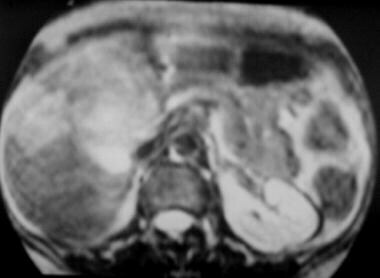 Bartolozzi C, Battaglia V, Bozzi E. HCC diagnosis with liver-specific MRI--close to histopathology. Dig Dis. 2009. 27(2):125-30. [Medline]. Do RK, McErlean A, Ang CS, DeMatteo RP, Abou-Alfa GK. CT and MRI of primary and metastatic fibrolamellar carcinoma: a case series of 37 patients. Br J Radiol. 2014 Aug. 87 (1040):20140024. [Medline]. Valentino PL, Ling SC, Ng VL, John P, Bonasoni P, Castro DA, et al. The role of diagnostic imaging and liver biopsy in the diagnosis of focal nodular hyperplasia in children. Liver Int. 2013 Jun 12. [Medline]. McLarney JK, Rucker PT, Bender GN, et al. Fibrolamellar carcinoma of the liver: radiologic-pathologic correlation. Radiographics. 1999 Mar-Apr. 19(2):453-71. [Medline]. [Full Text]. Photograph of a resected gross pathologic specimen of fibrolamellar carcinoma shows a lobulated, tan-colored mass with a stellate, central scar.